(Anonymous sale, Paris, Hotel Drouot, 20 March 1950, lot 64, as Honthorst). Private Collection , France, 1953. 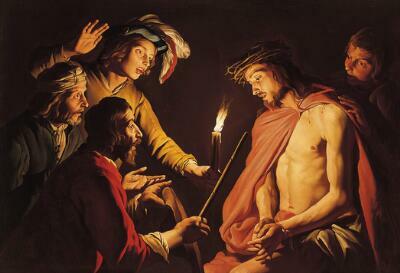 In this painting by the celebrated Dutchman Matthias Stom, Christ is surrounded by his tormentors, sharply illuminated by the flickering light of a single candle. Their harsh taunting has turned to questioning, conveying a quiet, almost contemplative mood. Stom radically simplifies both setting and composition to allow the story to unfold without distraction. He depicts the biblical figures in contemporary costume to make the event more accessible to his viewers. In the 17th century, the Catholic church saw art as a powerful tool against the Protestant movement, which had divided Christianity. Counter-reformation teachings encouraged artists to make devotional paintings as moral examples for the faithful, prescribing directness and realism as the most effective approach to religious subjects. Active in Italy, Stom was among the second generation of Dutch artists to be influenced by the revolutionary Italian painter Caravaggio. Here, his focused composition and dramatic lighting intensify the emotion of the scene, inviting our empathy and compassion. To hear more about Caravaggio’s seminal influence in Holland, press 1591.